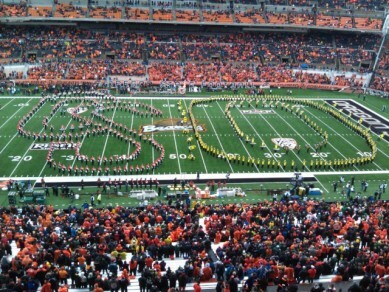 Fishduck Writers Present Our Greatest Duck Moments In 2012! Our beloved Oregon Ducks have been outstanding this year in all areas of athletics. What follows is the contribution of many of the Fishduck writers, in bringing to you the highlights that we witnessed in one of the finest years ever for the Oregon Ducks! 2012 featured so many bright spots and worthy moments for the Ducks spread across so many different sports, but my choice is about the two-fold victory in Corvallis. The obvious win was the 48-24 beatdown on the field, which was also the fifth straight for the Ducks in the 116-game series. The win revealed the character of the team, as it signaled a major rebound from the Stanford loss. 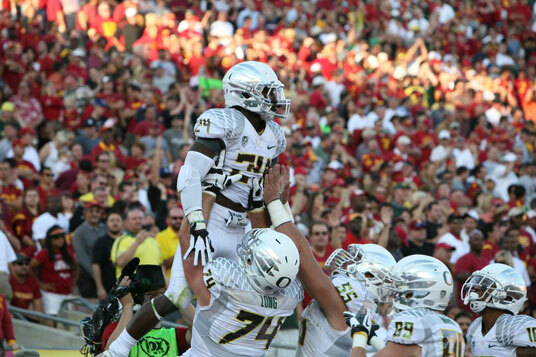 The key moment came in the second quarter, when Kenjon Barner and the Oregon rushing attack exploded. Barner, a career-long Beaver killer, had ground out 147 yards by halftime. On two consecutive drives – one putting Oregon up 13-7, then another making it 20-7 that broke the game open. It was on those two drives that Barner showcased his elite-level patience and elusiveness over and over again, mostly on outside runs as the offensive line continued to pave huge swaths of open field. It became clear the that the Beavers had no means of stopping KB and the Ducks, who went on to roll up 430 yards on the ground. The second win I witnessed was much less publicly visible, as it occurred between opposing fans exiting the game. In this video I hastily shot with a cell phone, we see a moment of character revealed from an Oregon fan, though this only shows part of the story. The severely intoxicated fan in orange was belligerent, stumbling and falling again and again, before finally coming to rest face up in a murky puddle of standing water on a saturated lawn. A high-moral fan in green, then helped the defenseless orange man back to his feet and out of the mud. Ashton Eaton, a Bend, Oregon native, collected five (five!) national championships in track & field before graduating from UO in 2010. He stormed into national fame at the U.S. Olympic Trials under the rain in Eugene, as he set a new world record in the decathlon, scoring 9,039 points. He rode a wave of momentum into London, where he put together a magnificent two-day performance in the decathlon. He won three of the decathlon’s ten events: 100 Meters, Long Jump (half-meter further than anyone else), and 400m (full second faster than anyone else). He also finished second in the High Jump and 100 Meter Hurdles, and grabbed third place in the Pole Vault. Eaton dominated from wire-to-wire, doing so with a level of consistency that is the stuff of legends. 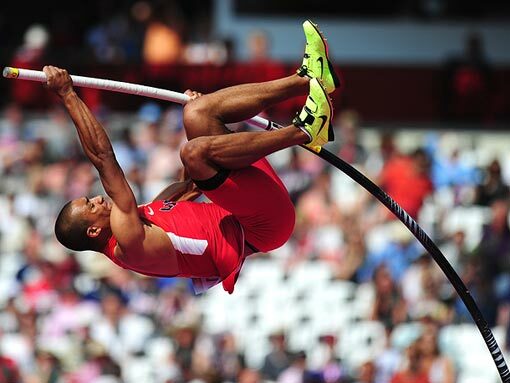 That’s what it takes to win the title of “Best Athlete in the World,” and Ashton Eaton did it with panache and gusto. The Portland native graduated as a Duck with five individual national championships, a relay championship, two NCAA cross country team titles and an indoor track NCAA team title. Oh, and he broke a few records held by some guy named “Pre.” Was he done? That was just his opening lap. After a highly-publicized training partnership with British great Mo Farah, Rupp didn’t disappoint in London: late in the 10,000 Meters final, Rupp ran a simply masterful final lap. With 200 meters to go, Rupp surged around the turn, kicking in front of one runner, and then opened his stride over the final 100 meters, putting the pedal to the metal to pass one more runner and finish second, right behind Farah, his training partner. 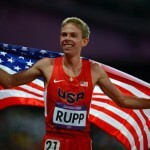 Rupp’s silver medal was the first for a U.S. male in the Olympic 10,000 meters since Billy Mills’s gold in the 1964 Olympics. Rupp’s rise to stardom helped give Tracktown USA a new jolt, and gave the U.S. a real distance contender for the first time in generations. Let’s not forget that 2010 Duck alum Keshia Baker grabbed an Olympic gold medal for her role on the U.S. Women’s 4 x 400 meter relay team. Her resume from the UO speaks for itself, and Baker realized an Olympic dream as she raced for the U.S. during the preliminary heat of the 4 x 400 Meter Relay in London. She, along with alternate Diamond Dixon, subbed in for sprinting stars Allyson Felix and Sanya Richards-Ross while they ran individual races. 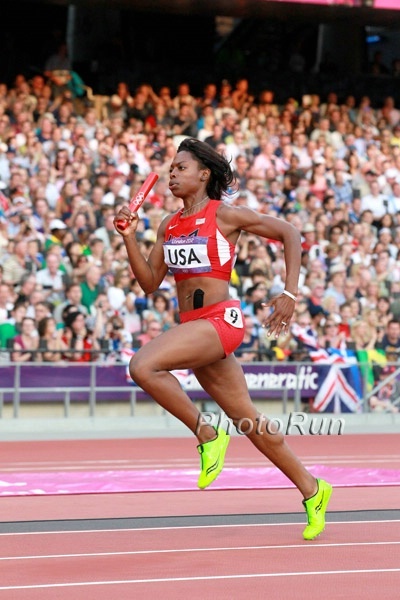 The preliminary 4 x 400 team posted a field-best 3:22.09, which gave the U.S. women the pole position for the final. The women’s team took advantage of the opportunity, crushing the rest of the field by three and a half seconds at 3:16.58. For her efforts, Keshia Baker earned a gold medal. 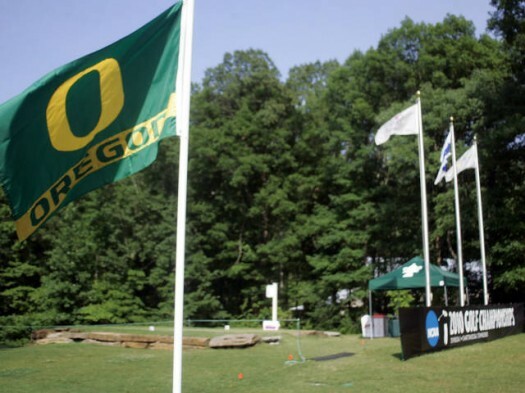 Sometimes lost in the flurry of coverage of Ducks’ sports is the fact that the UO Men’s Golf team has made the NCAA Final Four two of the past three years: an achievement almost any athletic program in the country would envy. Additionally, the golf team has the most innovative workout routine in the nation, to go along with some serious pop-and-lock moves. Oh, and they taught Kenjon Barner how to putt like a champ. Last June, the Ducks soared into a Final Four match against Texas after a come-from-behind win against UCLA. The gutsy win was just one of many clutch performances by the Ducks, propelled by the talent and experience from seniors Eugene Wong, Daniel Miernicki and Andrew Vijarro. The Ducks didn’t quite get the job done, falling 3-2 to eventual national champion Texas. But what a run for the Duck Duffers: two Final Fours in three years qualifies Oregon as an elite golf program. The Ducks used creativity, speed, and opportunistic play to break the long drought. 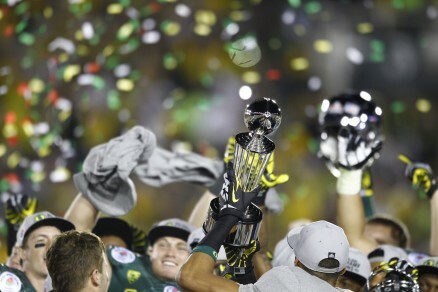 After waiting 95 years, the Oregon Ducks won the 2012 Rose Bowl. 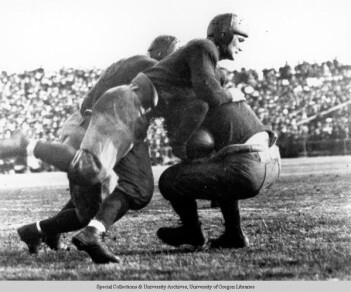 For the record, the last time Oregon won the Rose Bowl, beating Penn 14-0 in 1917 in front of 25,000 fans in temporary grand stand seating at Tournament Park, the Rose Bowl hadn’t been built yet. Darron Thomas passed for three touchdowns, De’Anthony Thomas scored on runs of 91 and 64 yards, and the Ducks earned their first bowl victory under coach Chip Kelly, holding off the Badgers 45-38 in the highest-scoring Rose Bowl ever played. Oregon showed off that creativity with 621 total yards — second-most in Rose Bowl history — against the tough Badgers, playing as fast as the referees could position the ball until the final whistle. 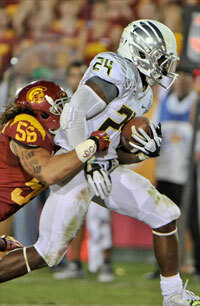 Lavasier Tuinei caught eight passes for 158 yards and two TDs for the Ducks. The victory wasn’t without drama, Wisconsin got the ball late at its own 13 with 16 seconds left. Quarterback Russell Wilson completed two passes to the Oregon 25, but with only two seconds remaining at the placement of the ball, the clock expired before Wilson could spike it — sealing the Oregon win. 2012 was a great year for women’s track and field and cross country. Their run began with a third straight NCAA Indoor Championship in March. At the NCAA Outdoor Championship in June, they scored enough points to win the meet five of the last seven years, but senior-laden LSU took the crown, and the Ducks had to settle for their fourth straight second place finish. In addition to individual wins by English Gardner in the 100 meters and Brianne Theisen in the heptathlon, fellow sophomores Chizoba Okodogbe, Laura Roesler, and Phyllis Francis joined Gardner in racing to a school record of 3:24.54 in winning the 4 X 400 relay. To put this in perspective: if Oregon’s sophomore class were a country, their relay would have finished fifth at the 2012 Olympics. 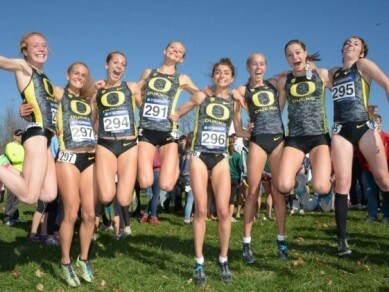 More recently, seniors Jordan Hasay, Alexi Pappas, and Katie Conlon led the Duck women to the NCAA Cross Country crown. The Oregon women figure to be favorites to win their fourth straight indoor championship in March. If they can knock down the indoor and then the outdoor championship in June – which will be in the friendly confines of Hayward Field – they will be the first team in NCAA history to take all three women’s crowns in one school year. All we had ever seen of him were grainy tapes from high school games in Hawaii. He looked amazing, but so does every D-1 player on YouTube. Then there were rumors of him outplaying assumed starter Bryan Bennett in spring practice. But grainy films and rumors weren’t eight yards a carry and a 165 passer rating – Bennett’s career numbers coming into the spring. Then came the first public appearance of Marcus Mariota in the Spring Game, and that run that had everyone wishing they could fast forward to September. Everyone talked about his fake at the LOS, but it’s his splitting of the second tier of defenders before he sprints past the secondary that made everyone salivate at his possibilities. Once named the starter, every fan was waiting to see that kind of explosive run again; and for half the season, he seemed a shoelace away from breaking one. 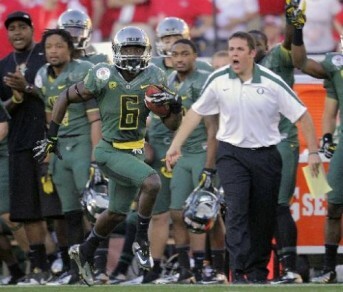 Finally against ASU, with a defense keyed on De’Anthony Thomas, we got what everyone wanted: 86 yards of amazement. 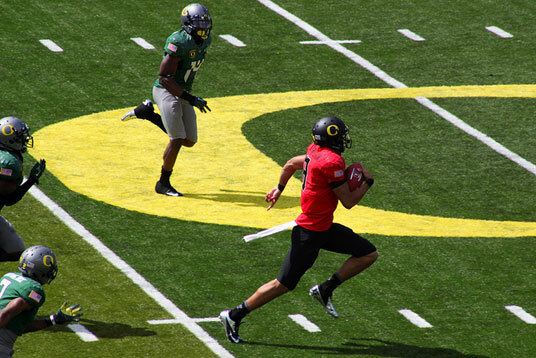 Yet it was Mariota’s 77-yard run against Stanford that served as the season’s perfect metaphor. Fans can dwell on the end result, but doing so ignores how Oregon got close enough to entertain any disappointment in the first place: because of their freshman QB, who wasn’t a bad passer, either. Befitting of the setting, Kenjon Barner took Hollywood by storm on November 3rd, showcasing his skills in front of a national audience in the Coliseum against USC. As Oregon took their Fiesta-bound tour into Los Angeles to face the shaky Trojans, Barner — the perennial backup for most of his career at Oregon — exploded onto the national scene in the most dramatic of ways. Leading the way in a 62-51 victory, Barner finally stepped out of the shadow LaMichael James had created. Showing veteran leadership and patience – and a physicality that had been previously unseen — Barner stood toe-to-toe with every punch USC threw, eventually breaking the Trojans back with a touchdown scamper late in the 4th to seal Oregon’s victory. Barner’s performance of 321 yards (breaking the school record of 288, previously held by James) and five touchdowns was the crown jewel of his Oregon career — a fitting day for a player so often undervalued for his performances on and off the field. Kenjon may not go down as the best running back to ever don a Duck uniform; that distinction will in all likelihood remain with James. But, if only for a day, Kenjon proved where he belongs. A leader, a warrior and a champion. A star, long lost in the shuffle, finally got his chance to shine. 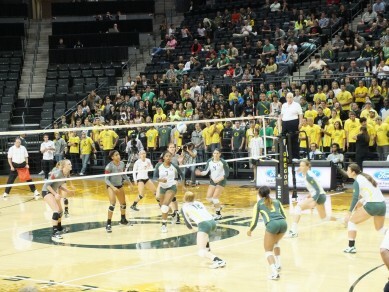 Ducks Volleyball Flies Higher Than Ever Before! The PAC-12 is, top to bottom, probably the deepest conference in volleyball. Success is difficult to come by, especially against the southern California schools, along with perennial powerhouse Stanford. The Oregon Ducks volleyball team opened their 2012 season with a #4 PAC-12 preseason ranking; a reflection of the respect accorded to the program coach Jim Moore has been steadily building, and the return of seniors Alaina Bergsma, Katherine Fischer, and Haley Jacob. The Ducks also opened their season touting an excellent recruiting class that was ranked 14th in the nation. If you followed the volleyball team this year then you already know about Canace Finley’s contributions as a freshman. In seasons to come, you will surely hear about the others, too. This volleyball team was to exceed all prognostications, however, fueled by the leadership and play of Alaina Bergsma. The Oregon star garnered a total of six Player of the Week honors, more than any Duck before her. Supporting her efforts was Lauren Plum, who may be perhaps the finest setter in the nation, and the defensive talents of libero Haley Jacob. Kat Fisher proved to be a scoring machine, along with sophomore Liz Brenner and junior Ariana Williams. Oregon would prove to be an offensive powerhouse, and most of the nation would find itself at a loss to answer the play of these Ducks. Oregon would not only exceed their preseason ranking, but they would rise to a school record #2 ranking in the nation before suffering a loss at the hands of Stanford; however, they would not drop lower than #6 for the rest of the season. The playoffs would be magical, inspired by excellent play on the part of the Ducks that culminated in their victory over #1 Penn State in the semi-finals. For the first time in the history of Oregon volleyball, they reached the finals. Although they did not win it all, the Ducks can be proud of what they achieved over the season, ending as the #2 team in the nation for the first time ever. Alaina Bergsma would end her career at Oregon as the AVCA National Player of the Year, the first time a Duck has ever garnered such an honor. She led the conference in kills and points, and was in the top five in the nation in these categories as well. Bergsma, of course, was also the PAC-12 player of the year, in the nation’s deepest conference in volleyball. This Ducks volleyball team will miss the contributions of its seniors next season, but return an impressive arsenal of players. Liz Brenner, Ariana Williams, Lauren Plum, and Canace Finley will be the initial stars next season in another deep Oregon squad. We can look forward to another great season as the Oregon Ducks volleyball team continues to soar to unheard of heights in 2013!